Atmospheric aerosols play a significant role in the climate system through radiation forcing of the atmosphere and public or human health through adverse air quality associated with air pollution. The combined contributions to air quality and climate issues makes the aerosol system one of the most important components in the atmosphere to understand, nevertheless, its effects are still poorly elucidated(IPCC, 2007). Aerosol effects on both climate and human health depend on the particle size, composition and concentration that vary in time and space; thus, in order to evaluate the potential risks and to comply with the international and local agreements on air quality (CAFE, 2008; Air Quality Standards Regulations, 2011), specific emission sources should be identified. A significant improvement has been made in recent years with an introduction of an Aerodyne Aerosol Mass Spectrometer (AMS) and, especially, an operational Aerosol Chemical Speciation Monitor (ACSM). 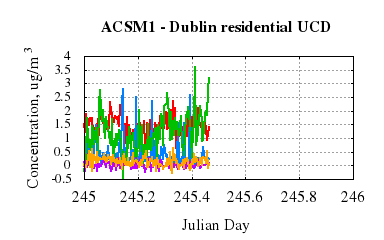 ACSM is a monitoring instrument with a 30-minute operational data output temporal resolution to overcome the deficits currently applicable to the trans-boundary air pollution networks (missing the often dominant organic contribution to air pollution and low (daily) time resolution for chemical speciation). Using an ACSM for the monitoring purposes enables to solve these issues in a relatively cost effective way. 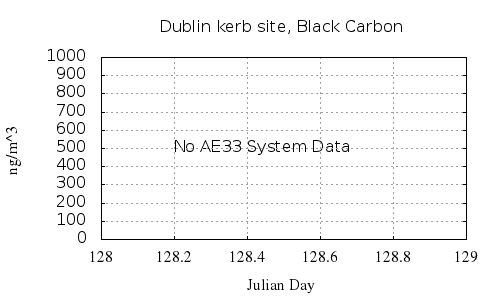 The work envisaged in this proposal will deploy state-of-the-art aerosol mass spectrometry techniques in conjunction with source apportionment techniques and modelling to determine and assess the trans-boundary air pollution and biogenic source contribution as well as an impact from local domestic solid fuels on the ambient air quality in Ireland. 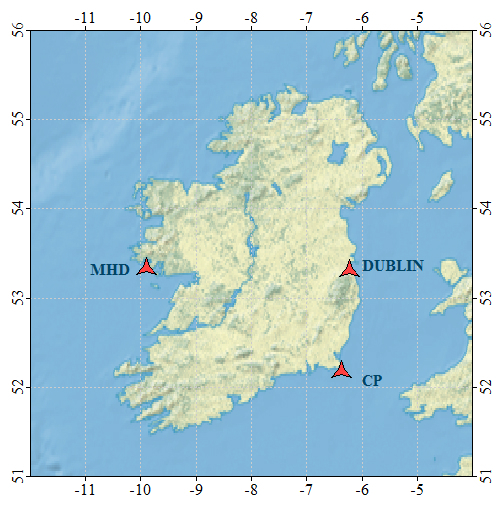 Measurements of aerosol chemical composition (Org, SO4, NO3, NH4, Chl) and black carbon will be performed in three parallel locations: west coast of Ireland (Mace Head), east coast (Carnsore Point) and urban centre (Dublin). Concurrent measurement in three strategic locations will allow a QuasiLagrangian study for periods of connected flows between the sites, which would not be possible if measurement were not concurrent, but rather on a campaign basis. 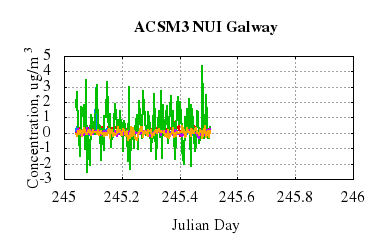 For that purpose 3 AMS instruments will be deployed at the same time: HR-ToF-AMS at Mace Head and 2 ACSM’s accordingly at Dublin and Carnsore Point (figure). 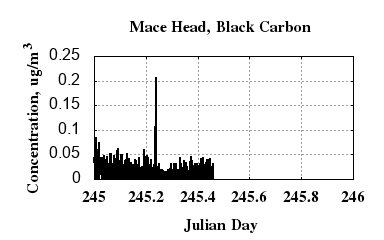 Along with the AMS’s, black carbon measurements will be executed for the same time period and locations. 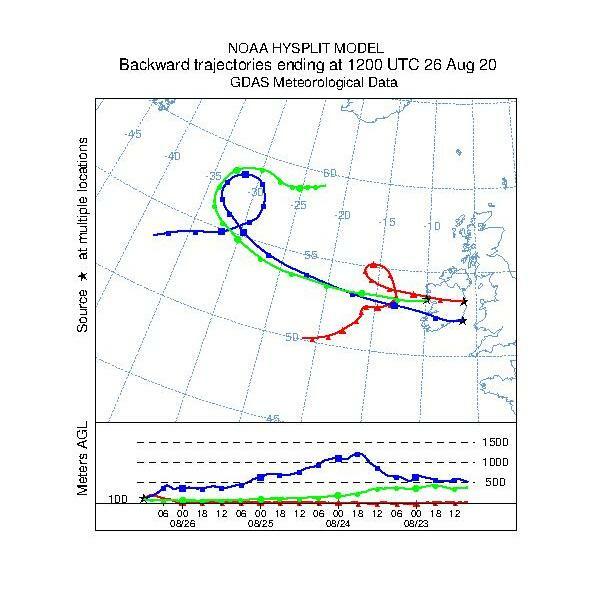 The observations will extend for 1 full year and cover different seasons of the year, and thus very different aerosol types and mixtures coming from the polluted northern hemisphere as well as more pristine marine environments. This network has no precedent in the world as there were no concurrent measurements performed in one country in three different locations for a 1 full year and will pioneer the future of trans-boundary pollution. Acknowledgements: this project is funded by the Irish Environmental Protection Agency.